Wow, what a showcase event! I hadn’t thought I’d be able to get tickets to the opener, but I did and it was fantastic. 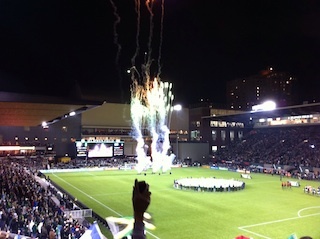 Typical Portland: Cold and rainy, fireworks, green smoke, crazy fans, and the right result on the field against a majorly reshuffled Philadelphia Union team. The season were definitely “obstructed view” but that didn’t matter as the Timbers did most of their work in the second half at the goal near me and I got to see it all right up close. That first half was hit-and-mostly-miss, as the Timbers dominated possession but couldn’t do much with it. I didn’t have an optimistic feeling with a FK went in at the other end (it turned out to be via deflected help from one of our players). But then we got our own good fortunate when the young Philly keeper Zac McGrath somehow let a weak header slip right through his fingers and into the goal. Just an incredible lapse and we were back in it. That goal recharged the Timbers and we poured it on after that, scoring two more, both heavily influenced by MLS Player of the Week Alhassan, who placed a perfect ball into the box for our new Scottish striker Kris Boyd to head into the goal, and then Alhassan got one of his own with a shot-cross to the back post that went in. It could have been even better, but Freddy Adu cleared another Boyd header off the goalline. I went to this game last night and my main impression was that it was cold. I thought I dressed warmly but it wasn’t enough, and even non-stop chanting and clapping and jumping up and down didn’t keep me warm (especially toward the end). But it was still a lot of fun. I can’t believe that 15,000 people would show up for a meaningless pre-season friendly — essentially just a practice match without half of the team’s top players — but that’s the way we roll here in Portland. The Timbers Army was out in force and the atmosphere was terrific. The game itself wasn’t anything awesome, a bit slow and not a huge number of chances for either team, but I’ve seen worse in league play at times. There were very few fouls and no hard ones, and I think the players didn’t want to get injured. The Timbers dominated possession and chances, but Chivas defended very well and looked dangerous on counters. They scored first on a cross that got redirected in, but Portland came back late in the game to secure the draw and remain unbeaten in preseason play. Our goal was also a redirect and the Chivas keeper blocked it but somehow allowed it trickle over the goalline. It was hard for me to see the goals as both were at the far end of the stadium. It was still great to see some of the new guys for the first time and the team overall. The 2012 MLS season kicks off in a couple of weeks and I’m starting to get excited! 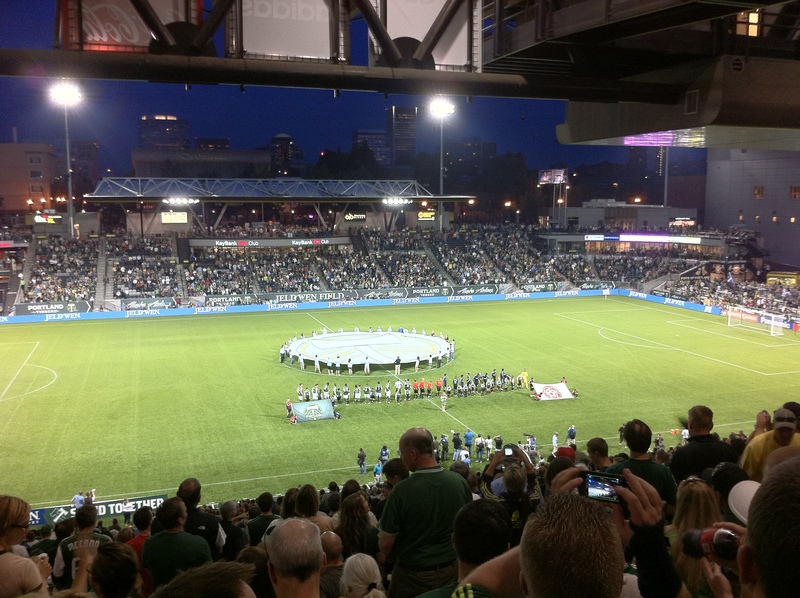 I went to the Timbers’ game last night and it was a frustrating night. Everything was on the line: the Dynamo were three points ahead and in the final playoff position. A home win would have put Portland right back in the mix, and with our final two games being on the road, a victory was essential. But they went downhill from there. The Timbers were oddly disjointed. They were eager and showed some aggression, but they always wanted an extra touch on the ball and that allowed Houston to shut them down every time. I thought Houston had a poor first half, with only one good chance on goal that our keeper saved. But then the ref muddled things up. He failed to call a clear foul on our Sal Zizzo, who went down injured, and when Houston went to the other end, he called a much weaker foul against Portland. With Sal still injured, that meant Portland had to face that free kick a man down, and of course Houston somehow got the ball in through the box. I hoped after the half things would get better, but they actually got much worse. Houston, filled with confidence with a leading goal, played much better and the Timbers’ struggles just got worse. Lots of pointless giveaways, sloppy passing, more strange delays before shooting or crossing, and a certain sluggishness that always allowed Houston to get on to any loose ball or close down any breakaways. Within minutes the Dynamo got their second, what appeared to be a cross that turned into a perfect shot from the wing, and after that there was no looking back. The Timbers did produce a couple of good moments, forcing two great saves out of Tally Hall, the Houston keeper, but overall their chances were too few and the away team fully deserved the win. A sad way for Portland to end their home season. There are still two games left on the road so I suppose there’s mathematically a chance for the playoffs, but I find that absurdly unlikely, given the team’s road record and the way they are playing now. Even if they did somehow manage to get in, they’d be out in a heartbeat. It’s still been a remarkably good debut for an expansion team. I’m sure the club has learned a lot and I look forward to some needed improvements to the team next year (perhaps a real designated player). Portland started off rocky in the first few minutes, allowing San Jose time on the ball and chances, and that had me a little worried. But then the Timbers got a great goal with terrific work to get to the endline and cross the ball back to the penalty spot for Kenny Cooper to score (his second in two, which is awesome, because we really need him to get hot for the playoffs). Unfortunately, after the goal Portland continued to let the Quakes dictate the run of the play. We really escaped on several occasions, including one gift for Wondo that he should have put away but with only the keeper to beat he took an extra touch and a defender was able to clear it. The second half was more of the same, Portland doing too much defending and not attacking with the urgency they did against New England last Friday. Perkins was huge, keeping Portland alive. In the end, that cost them, as they gave up a late goal. They just didn’t close down San Jose and allowed Khari Stephenson to shoot from outside the box and while most of the Earthquakes’ previous shots had been right at Perkins, this one was low and to the corner giving him no chance to save it. Everyone hoped the Timbers would rally back, but with only about ten minutes left, there just wasn’t enough time. Several late substitutes made little impact for Portland, though Perlaza did have one breakaway he should have done better with. Crosses and finishing were very poor and San Jose was definitely the better team overall. I will say the refereeing was particularly horrible in this one. It seemed every niggling call went against us, but whenever San Jose did the same thing, the ref ignored it. There was a foul on Nabe in the box that should have a penalty, and when two Timbers’ were fouled during the same play, the ref only gave out one yellow instead of two. Still, a point is a point and with New York’s loss, it’s enough to put Portland back in the playoff picture. We’re still on the bubble, though, and must beat NY this weekend to keep that position. That game now is our whole season. One of the craziest games I’ve ever seen. Anyone who can watch soccer like this and not be entertained is dead. Once again the Timbers came out flat and coughed up a terrible goal just five minutes in, allowing NY to run rampant right through their defense. Though that was pretty much all NY did in the half, Portland gave the ball away constantly, didn’t pressure when NY had it, and defended frantically. It was men against boys with the Timbers only got one off-target shot the whole half — the most exciting thing was the contestant winning a thousand dollars during the halftime show. I held out little hope for a victory and prayed for a tie and feared what the second half would bring. I don’t know what happened in the locker room, but though they had on the same jerseys, a different team came back on the field. From the kickoff they swarmed over NY who staggered back unable to stop the assault and within minutes Captain Jack Jewsbury buried a grounder to the back post. Former New Yorker Kevin Goldthwaite had come on for Portland to start the second half and I’d joked to my friend that he would score against his former team. Well, the coach looks like a genius, because a moment later, he does, a nifty backheel right in front of the net started off by a Jewsbury free kick through the box. Five minutes and Portland lead! It was amazing. The stadium was in delirium. Portland continued to dominate though NY did occasionally look dangerous when they tried to break out. Then Perlaza gets to the endline on a great run. No Timbers were in the box for the cross so he just puts it across the face of the goal. I don’t know if he saw Keel sliding but if he did it was a brilliant play because former Timber Keel couldn’t stop his slide and his momentum just carried the ball into his own net! What made this even funnier was that I’d joked before the game that Keel would score an own goal as that would be fitting with the theme of scoring when playing against your former club. The whole stadium erupted with cheers and jeers when Keel’s picture was put on the big screen. Hilarious. But things go somber when with 20-something left Thierry Henry has a brilliant double give-n-go on the left side and breaks into the Portland box and professionally slips it past Perkins to bring one back for NY. Yikes. Nail-biting time. But Perlaza as another breakaway into the box and NY’s goalkeeper Greg Sutton brings him down. Perlaza was looking for it, but still a clear penalty. So, after Portland’s recent adventures in penalty taking, who would take it? Captain Jack steps up and I was worried: it felt like an extra-heavy burden to take on. Sutton’s a monster of a keeper, too, at over 6’5” and I think all that made Jack try too hard to put the shot in the corner and it came off the post. Arrgh! So the game is still 3-2 and tight. 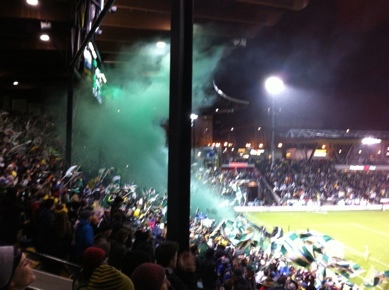 But the Timbers continue to play well and dominate and probably should have had another goal for their troubles. They hold out into the four minutes of stoppage and things are looking good. That’s when chaos erupts as Henry pushes one of our players to the turf in an off-the-ball scuffle. The ref consults with his linesman and then pulls out the red for Henry! The superstar is off! With only a few seconds left, Portland has this one wrapped up, right? Not so fast. A ball up the right wing into space is harmless enough as Goldthwaite is there to clear it… but instead of just blasting it into the stands he hesitates, perhaps wanting to control it, and then when he’s in serious danger of losing the ball he panics and rushes his clear, whiffing on it. New York’s DeRosario takes the gift up the right wing and manages to get in a hard cross from the endline. No one from NY was really in the box so it was a harmless situation, but the ball struck Wallace in the arm and the the assistant ref waves his flag frantically. I don’t think the main ref was going to give it, which seemed fair since it was more ball-to-hand instead of hand-to-ball (and the rulebook does say handballs must be deliberate), but with the assistant so adamant (my impression is that assistants seem to be more literal about calls than center refs who use their judgement on calls), the ref awards NY the last-second penalty and DeRo ties it up with the final kick of the game. Arrgh! Only a point when Portland should have had three. But still, this didn’t feel like a loss because they’d played so well (if you forget the first half). The team is struggling to put on a full 90-minute performance and if they get so they can do that, they could be a formidable team considering the way they played against Colorado last week and NY this week. But they’ve got to stop the foolish mistakes and allowing defeated teams back into matches. Fun game to watch, though. A wild game full of chances. In the first half, Timbers created some chances but blew them, while Colorado looked extremely dangerous when they attacked, forcing several critical saves out of Timbers’ keeper Troy Perkins who was huge. The second half was much better for the home team, which kept possession and limited the Rapids to no real serious chances while created a ton of opportunities for themselves. But the Timbers’ finishing was woeful, as they just couldn’t score. They shot high, they shot wide, they even got a few on goal only to see the chance saved by Rapids’ keeper Pickens. It looked like for sure it was going to be a disappointing nil-nil at home for Portland, when in stoppage time, out of nothing, a FK was floated into the box and an open Rapids player put his header on goal. Troy made the save again, but the rebound fell right to a Rapids player who had an open corner of the net in front of him and I thought it was all over. But somehow Troy made another save on that try, though the ball wouldn’t stay for him and slipped out into the crowded box and no one could clear and then Drew Moor blasted in the dramatic late winner for Colorado. Portland had one more huge chance in the final minute after that, but again the shot was over the bar and that’s all she wrote. Disappointing, for sure, but strangely, this did not feel like a defeat at all, mostly because the Timbers clearly outplayed the defending champs who were on their heels all night. The crowd had a great time and the cheering was loud and strong and spirits were high even after another home loss. If Portland can keep playing like this, they will win games. It’s just frustrating that they can play that well and not score and lose. Portland 3, Dallas 2: After the high of Thursday’s historic home opener, you had to wonder how this game would go. Would Dallas spoil the party? I was at this game in person and wow, what at atmosphere! The Timbers Army chants and sings the entire match, non-stop. Fans everywhere couldn’t wipe the silly grins their our faces. Everyone was in a jolly mood and it wasn’t just the rare sunny day. You could feel the electricity in the air, a sense of history in the making and we were all a part of it. From the collection of TV news vans out front (every local station is covering the Timbers like mad), to the renovated stadium which, while it has the bones of an old soul (to mix metaphors), is beautifully redone. The old stadium always had a split personality as it also awkwardly housed a minor league baseball team. Now everything about the place is Timbers, with Timbers green everyone and the famous axe logo tattooed on everything. It is awesome. Our seats were up in the second balcony the stands, near center field, but it felt really close on the action. We did have “obstructed view” seats with a roof-support column a few seats in front of us, but it wasn’t that bad as you could lean to see around it. Actually worse were the trio of TV cameras right in front of us as they obscured any action along the sideline and leaning or standing didn’t help see around them. I don’t think I’d want my season tickets there, but for this game it was fine. Timber Joey, the lumberman who revs his chainsaw and cuts off slabs of a giant log every time the Timbers score, came by several times. On two occasions he brought by a slab for everyone to cheer and perhaps touch (I’m starting the rumor that “touching the slab” brings good luck, cures cancer, and promotes world peace). The game itself was fantastic. Portland played beyond their skill. You could just see the team improving with every pass. Confidence just grew and grew and lesser players began showing off their tricks. While it was obvious Dallas players are more seasoned and polished, the Timbers played them out of the park. Don’t let the scoreline fool you: this was a rout, plain and simple. Dallas could scarcely get the ball out of their own half and I counted dozens of occasions where when they tried, they were forced to play it backwards because there was nowhere to go forward. I was really impressed with the work-rate of our guys. We get our first goal 12 minutes in, via a ball fed back to an open Jewsbury just inside the box and he runs on to it and smashes it. It hits the post, comes off and hits GK Hartman in the back, and goes in! After going down a goal Dallas try to mount a comeback but the Timbers repel all chances and continue to attack. Off a corner kick in the 35th, Kenny Cooper skies to head home his first against his old team. Beautiful goal. Love the way he goes to lift up tiny John Spencer in his goal celebration. Dallas continue to get a lot of corner kicks, but don’t do much with them. Portland think they’ve scored a third just a minute or so into the second half, but the goal didn’t count as Perlaza was a hair offside. But Portland continue to press and when Dallas fail to clear Alhassan slips the ball through into space deep in the box and Wallace is there to stab home his second of the season. On the hour Cooper misses a near post crossed by inches. But Dallas have chances too, with Milton Rodriques nearly getting behind on a 1v1. They get a header chance after that, though it was going wide, it still showed danger. Around the 70th I thought Dallas looked dejected and beaten and they looked like they were just going through the motions. I figured it they got a goal it would have to be somewhat flukey. To their credit they keep trying and in the 83rd, David Ferierra runs onto a ball in the box and just gets there an inch before the defender and knocks it in at the near post. That goal inspires Dallas and rattles the Timbers, who start to struggle and panic a bit, and then Brek Shay makes a great play, running onto a high ball in the box. He gets there just before the keeper who had come out to close him down and his little pop-over shot gets over the keeper and suddenly the lead is only a single goal. Nail-biting time! Soccer can be an unfair game sometimes, but it is a 90-minute game and the Timbers have to play every minute. Twice now they’ve led by three goals and then allowed the opponent to creep back into the match. But like I told my friend, “Later in the season I’d be more concerned about giving up goals. Right now I just want to see them chalk up wins.” The Timbers defend a little frantically, especially in stoppage time as Gleeson slaps away a cross for a corner kick. Dallas nearly get an equalizer with a shot at the near post that Gleeson is forced to tip up off the crossbar. Whew! Crazy stuff, but Portland hold on for the three points and now are in fourth place in the West and tied with the highest scoring teams in the league. Amazing. Portland 4, Chicago 2: Wow, what a game! I knew the fans and atmosphere would be great, but I honestly wasn’t too hopeful that the team would back that up. But they were clearly the better team on the day and the scoreline actually flatters Chicago who showed very little. Portland seemed to score early via a Cooper header, but the goal was waved off by the ref, apparently because the ball curled out going in on the corner kick. Very questionable (and a call I’m not a fan of anyway). But justice came later in the match. Around the half hour mark Portland do get on the board, with terrific play in the midfield where a player was on the ground and leaped up to get the ball and play a beautiful through-ball into space for Perlaza who is in alone on the keeper. He cuts the ball back and I thought maybe the chance was gone, but the defender and keeper muck each other up and Perlaza feeds it into the goal and Portland lead in their home opener. Pandemonium in the Portland stadium. Portland use that energy to go forward and soon score another before the half, when a ball is poorly cleared out to the edge of the box where Wallace smashes it through the crowd and it deflects into the net. Timbers make it three-oh early in the second half when Chicago keeper Shaun Johnson can’t hold a wet ball and Perlaza is there to tap home the rebound. It’s looking like a dream match for Portland. Unfortunately things go a bit sour when a dangerous ball splits the defense and the Timbers’ Brunner slides in to clear and ends up knocking the ball past his own keeper. With the goal Chicago have hope and play better and finally get their best chance with a nifty chance inside the box. Marco Pappa creates space for himself and curls one. Portland GK Gleeson slaps at it and gets his fingers on it, but can’t quite get enough contact to push it over the bar. It strikes the underside and drops into the goal and suddenly the lead is just one. A tremendous victory starts to seem dicey. But Portland get the equalizer on a crazy play in the goal mouth when Cooper handles the ball during his leap and Chicago can’t clear and in the scramble it’s knocked in. Replay shows it’s an own goal by the Fire, but Perlaza claims it. It shouldn’t have counted, but Portland’s first goal was taken away so counting this one is justice. With the two-goal margin restored, the Timbers hold out for their first MLS win. Huge! This was the second leg of the playoff match to see who gets to the championship game. I haven’t been to a Timbers game in a while (I’m not sure why, exactly) and I am definitely going to go to some next year. This was a lot of fun. There was a great crowd of nearly 15,000 and the atmosphere was exciting. The game was terrific, with six goals. Sadly it finished 3-3, a draw, which eliminated Portland as they lost their away match in Vancouver. They came very close to tying the aggregate and sending the game to overtime, but just didn’t quite make it. I can’t wait for the Timbers to be part of MLS! Fun game! This was Seattle’s new MLS team facing off against one of the best teams from England (and the world) and the lopsided result was expected (pretty much any single player on Chelsea’s team makes as much as Seattle’s salary cap for the entire team). Chelsea convincingly and deservedly won 2-0, but Seattle had tons of chances and it was a blast to be there among the 65,000 in the stands. Every time Seattle came close to scoring 65,000 people would leap up and cheer (and then groan when the chance was missed). We were up near the top under the roof with a great view and it was actually chilly with a strong breeze and no hot sun. A fun day, though $40 for parking is obscene. You can see some of the pictures I took on my Flickr account. Today the Houston Dynamo defeated the New England Revolution 2-1 at RFK Stadium in Washington, D.C. to win their second consecutive MLS Cup. It is only the second time in the history of the league that a champion has held on to their crown (DC United did it in 1997). It was a cracker of a match, with Houston, ironically, having the fewer chances but capitalizing when it counted — the exact opposite of their season where they would have tons of chances in a game but few finishes. Typical of Houston (and the San Jose incarnation), they do it best through adversity, giving up a headed goal to Taylor Twellman early in the first half. But Houston was calm. After all, just a few weeks ago they were two goals down to Dallas in the playoffs and won that series 4-2. And who can forget last year’s immediate comeback against this same New England team in the final? Houston’s been a second half team all season and this game was no exception. They kicked things up a notch in the second half, coming out with more aggression and determination and fixed some of the defensive lapses they showed in the first half. New England, it must be said, looked like they thought they’d already won (shades of last year’s Cup), and failed to be as aggressive as they could and scorned a few gorgeous opportunities. The comeback for Houston started with a fabulous sequence of pressure by the Dynamo, getting the ball deep into New England’s box and creating several dangerous chances. A Houston corner kick was rejected, but aggressive play from Dynamo Captain Wade Barrett kept the ball in play at the near sideline and he managed to toe-poke the ball to teammate Brian Mullan who fed a long ball into the box. It skittered across to Dwayne DeRosario on the far side and he managed to cross it hard into the box. It was too hard for Jaqua who was crashing in but it fell gloriously to Joseph Ngwenya. But he flubbed his left-footed shot as the ball went through his legs. But the Revolution defense didn’t clear the ball and Joseph didn’t quit, taking a second swipe at the ball with his right and sliding it underneath Revs’ keeper Matt Reis to level the score. Late in the game New England had a couple opportunities but couldn’t capitalize. One of the best was a cross through the box with Twellman waiting at the back post for a certain tap-in goal, but Dynamo goalkeeper Pat Onstad (my Man of the Match) flew in and got his fingertips to the ball to snare it with a fabulous saving play. Even better, the rebound was easily dealt with by the Dynamo defense and a counter-attack started. Exactly forty seconds later, the Dynamo scored at the other end. Ngwenya’s good hold-up play on the right wing got the ball to Waibel who’d run up in support and he played it to a wide open Brad Davis just outside the box. Davis’ gifted left foot placed the ball perfectly in the box for De Rosario who snapped his head to the ball knocking it into the far corner past a helpless Reis. The defending champions were now leading with less than twenty minutes to go. The final few minutes saw some tremendous pressure from New England and an unbelievable save from Onstad. In the 87th minute the Revs took a corner kick which eluded the Dynamo defense and reached Larentowicz who met it with a diving header just three yards out. It was bullet of a shot that should have been a goal — but Onstad was well-positioned and the ball ricocheted off his legs and was successfully cleared by Houston. Amazing, and plays like that had to hit New England’s confidence where it hurts most. They never looked the same after that save, with Houston defending with authority and the Revs struggling. This was epitomized by play from DeRosario in the 91st minute when Jay Heaps twice tried to play a long cross to the box and both times DeRo leaped in front and blocked it with his back. If you can’t put in a simple cross from the half-field line with just one guy in front of you, what can you do? Disheartening, to say the least. The final play was a long feed from Reis that went right to his counter-part, Onstad, and the game ended without another chance for New England. While I feel deep sympathy for the Revs — I’ve been a fan of theirs for years, since their underdog days (us long-term San Jose fans related to them), and I can’t imagine what it is like to lose three finals in a row — I have to give the Dynamo the win in this one. While they defended more than I preferred, their defense wobbled but didn’t break, and they pressured aggressively (even when the game was tied) and took two chances and converted. If you look at all the little things in the match — the way the forwards helped out on defense, the work rate, the relentless pressure, their calmness in the face of mistakes — Houston deserved this championship. Nowhere was this more evident than the reactions of each team when they gave up their first goal: the Houston players nodded, clapped each other on the back, and gritted their teeth, while the Revs cursed and moaned and looked at each other in bewilderment and frustration. And remember, Houston did this without two key players in Brian Ching and Ricardo Clark, which is the hallmark of a championship team. Hat’s off to New England who fought hard, and played aggressive, attractive soccer. They have accomplished a lot: three straight finals and an Open Cup trophy is an amazing achievement. Their day will come. Congratulations to the Houston Dynamo! You guys were wonderful all season. You battled through adversities, injuries, national team call-ups, trades, and the inevitable human error. In the end you’ve repeated as champions, which people who know sports say is always much harder than winning the first one. Soccer’s a team sport, and Houston (going back to the San Jose days), is the embodiment of team spirit. I hope they never lose that. It’s what makes this group of rag-tag cast-offs from other teams greater than the sum of its parts. In a first for Major League Soccer, the same two teams that met last year in the final will meet again this year. New England won their game on Thursday against Chicago in a dreary 1-0 affair, and tonight the Houston Dynamo soundly defeated Kansas City 2-0 in a match where the Dynamo defense was so stout KC never got a single shot on goal! Oregonian Nate Jaqua scored in the first half and Dwayne De Rosario scored in the second, and KC never had a chance. This sets up a repeat of last year’s Cup, which Houston won on penalty kicks after a 1-1 draw. This is terrific, for both teams are excellent and both teams are motivated to win. Neither will be satisfied with another draw and penalty shootout: Houston wants to prove that last year was no fluke and that they deserve the title, and New England just wants to win a trophy (this will be their fourth final and they haven’t won one yet). So tune in Nov. 18th on ABC to see what should be a terrific battle. This was the big second-leg playoff match between Dallas and Houston with Dallas coming in with a 1-0 lead from last week’s home result. This time it was Houston at home and with over 30,000 fans in orange cheering them on, Houston was determined to win. Strangely, I wasn’t too nervous about this one. Houston was playing well with huge chances right off the kickoff and I just felt they would win. Even when Dallas got the first goal and it was a 2-0 lead, I felt Houston would get it back. In second half, things started to go the Dynamo way as Arturo Alvarez got himself red-carded seconds into the half and it was 11 on 10 the rest of the way. Coach Dominic Kinnear promptly took off a defender and added an attacker (Stuart Holden). With 23 minutes to go and still needing two goals just to tie it, I still wasn’t worried (which surprised me). The team was playing so well it was just a matter of time. Now the pressure which had been intense, went up to the breaking point, and Stuart scored the first goal for Houston. The momentum built from there as soon Brian Ching tied it up. We went into 30 minutes of overtime and just a few minutes in Brian got his second and now Dallas were on the losing end. A moment later and it was all over as Brad Davis scored a freakin’ awesome freek kick. The overtime was played out but Dallas never had a chance. Houston win the game 4-1, 4-2 on aggregate, and advance to the Western Conference Final. Go Houston! My cousin Phil has a season ticket package for the New York Red Bulls and gets a free membership to a sort of pre- and post-game club at the stadium. We arrived a the stadium an hour early and went to this pub for drinks and sandwiches (my grilled chicken was huge and delicious): much healthier eating than stadium fare. The game itself was excellent: New York and New England are big rivals and the atmosphere was great. Unfortunately, New York’s defense was occasionally amateurish, and mistakes cost them. Though the Red Bulls dominated and should have won, they created tons of chances by kept failing to score. Then they left Taylor Twellman unmarked on a corner kick for the Revolution’s first goal. But New York fought back with a goal of their own just before the half. In the second half it was a repeat: more NY pressure and attacking chances galore but no Red Bull goal, and then one half-chance for Twellman and he converted his second. Fortunately Angel got one for New York to tie it before the final whistle, but it was still a frustrating and disappointing day for Red Bull fans. Even worse, New York had a goal unfairly disallowed: the replay showed it was not offside and there was no foul and it should have counted, but the ref called it back, costing the Red Bulls two points in the standings. But it was still a fun game with plenty of goals and I was certainly not disappointed. After the game we headed home, but got stuck in horrible traffic on the George Washington Bridge where repair crews had it down to one lane. It took us a full hour just to cross the bridge! Another late night but we consoled ourselves with Baskin Robins’ ice cream and rewatched the game’s key moments on TV. This was my first chance to watch the Houston Dynamo in person and it was an excellent performance. They got a bit lucky, facing an devastated LA team and gave up a poor goal off a corner kick, but totally dominated and controlled the game. It was tied after the half but seconds in to the second period Mullan’s great play caused him to be fouled in the box and earned Houston a penalty kick which Dewayne De Rossario converted easily. With the lead again, Houston crushed the Galaxy with pressure, winning every second ball and every 50-50. Other than a couple chances, LA could barely get the ball out of their half of the field. The pressure finally gave when two Galaxy defenders each stopped thinking the other had the ball and Houston’s Ricardo Clark stuck out of a foot to poke the loose ball past a helpless Joe Cannon. Joe again kept his team somewhat in the game as he made a number of fine saves. With the win Houston again are atop the Western Conference table and clinch a playoff spot, and LA’s chances of making the playoffs are nearly gone. I’ve started a new Houston Dynamo blog on The Offside website. Check it out!